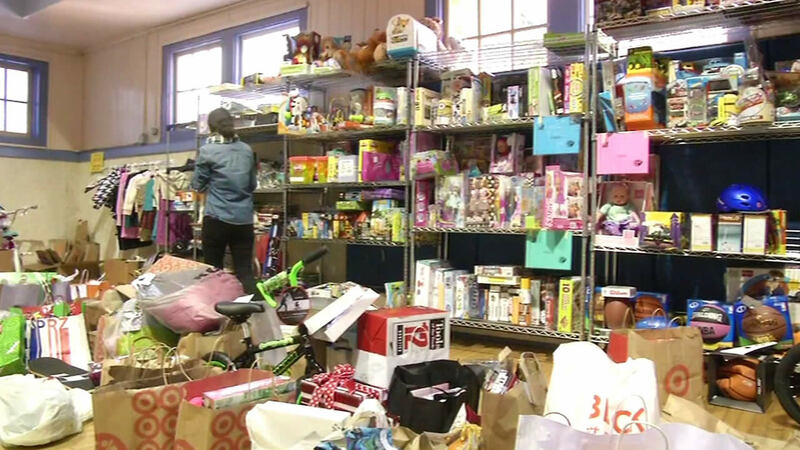 SAN FRANCISCO (KGO) -- Holiday giving is in full swing in the Bay Area. In San Francisco, GLIDE handed out food bags to 500 people near Japantown and ABC7 News was at the Jones United Methodist Church as volunteers stuffed the bags with turkey, rice and fruit. Similar food giveaways were held in the outer Mission District and Chinatown. Tuesday's event is just the start for GLIDE. Wednesday, it will hand out food bags to 4,000 people at its church in the Tenderloin. ABC7 News was also in the Haight as volunteers were busy wrapping gifts for homeless families. There are some 2,000 toys in all that will be handed out to 800 people who receive services from the Hamilton Family Center. "About 80 percent of the families that we work with, this is their first time ever experiencing homelessness because something happened. It is because something happened, or there was an unexpected medical expense..." Nicolle Gamerio from the Hamilton Family Center said. Hamilton Family Center provides emergency and transitional housing, and rental assistance to prevent evictions. Demand for their services are up 25 percent this year. The toys will be handed out next week. Santa was also very busy Tuesday morning, handing out toys to children in Oakland, as part of the Oakland Police Department's annual toy giveaway. Every year, members of the Oakland Police Department distribute donated toys to members of the community and every year, Santa hops on his police department Harley to spread some holiday joy.